I have a hot new product from Stokke® to share with you all today. A brand new blue Tripp Trapp®. For those of you out there that don't know what a Tripp Trapp® is - where have you been? This iconic product was launched 37 years ago back in 1972 and since then it has clocked up nearly 7 million sales around the world. When DinoBoy was born it was the one thing that I dreamt about day and night. I wanted one so bad that it hurt but I couldn't justify to myself spending over £100 on a highchair so in my ignorance I bought myself one of those convertible cube things. I hated it. DinoBoy hated it and it didn't take me long to purchase highchair number 2. This time I went for some hideously big Mamas & Papas creation. I hated this too. It was so big that it took over our small kitchen and it had so many places for food to get trapped that it was a nightmare to clean. So when I was pregnant again with ModelGirl the following year, I threw caution to the wind and finally handed over my cash and came home with my Tripp Trapp®. I fell instantly in love with it. Lets face it - how could you not? So when ModelGirl was born I went out and bought another one and then number 3 when FunnyGirl came along. As a highchair the Tripp Trapp® is great. I love that it sits up close to the table and that we can all share our mealtimes together. But it's when your little ones are at that in between stage - too big for a highchair - but too small for an adult chair that the Tripp Trapp® really comes into it's own. Our dining table really is the hub of house and I don't think that would be the case if the children weren't comfortable whilst sitting there. I always sit on one myself - if there isn't a small child to fight with and I will continue to for years to come. What a false economy it was for me when DinoBoy was born. I ended spending twice as much on the first two chairs that have now been ditched somewhere along the way. But what of our nearly 9 year old Tripp Trapp®? It's still going strong and has years full of life ahead of it. It really is a design classic that offers you great value for money. I was very conservative back then and went for the natural colour. There are now 12 different colours in the range and and I wouldn't like to have to choose which one is my favorite. The grey maybe, or the new blue, but the green is pretty hot too - and the girls love the pink..... Oh decisions, decisions! 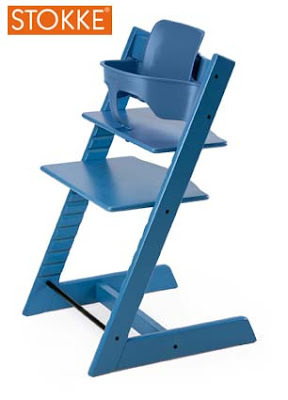 The new blue Tripp Trapp® will be available worldwide from August / September, so get your orders in now! Ohh I love it. A lot. I am going to BEG Mr to get me one! He should after I missed out with the Sleepi! Totally agree with you. Of all the baby products I have purchased or worked with (I was a Store Manager for Mothercare just before I had DS1) this has to be THE best in terms of its design, ease of use, longevity and cost per use ratio. I did like you and bought a huge plastic germ trap of a chair the first time round. For no 2 I still didn't think I could justify so bought a handysit, which was ok (like it for travel as it will slip in the basket of my maclaren) but when I found out I was Pg with No3 I thought, right I am having a Tripp Trapp this time. It also saved buying another dining chair! Hindsight is a wonderful thing, and I now tell evryone to buy a Tripp Trapp as they are definately the best highchair on the market and will last for years. It is so pretty, I am going to start saving now! I am not sure I will ever make my mind up about which colour though! Love this, wish I'd had one instead of the germ trap!! when i read the title of the post, I got excited... i thought you were talking about the HUGE tripp trapps I've seen at trade shows.. how freaking cool are they, I have to sit on them!! I love the Tripp Trapp.. after buying our 1st one for Sophie, My 3 boys got Very jealous.. so I had to buy them all one.. in the end i bought 6 of them!!! one for us all! (even me!) and I love them!! we got rid of the horrid dining chairs and I Bought a big new round table for us to sit at!! What a god send... the tripp trapps meant all the kids could sit at the table and not fuss.. or squirm.. 6yo always used to sit on his knees.. 4yo always got fed up with his shoulders being in line with his plate! and 8yo was just jealous!!! but now.... all 4 kids are now sat at the right height! in fact they love their tripp trapps so much that 90% of their time sat at home is at the table!!! its become the hub of our home!! If i could justify buying a 7th tripp trapp so i could get the blue, I so would!!! but i cant!! I've got no more babies to grow and the quality of the tripp trapp surpasses any mishap or accident it might have.. so no breakages means no more chairs!! Damn.. now if only they offered trade ins.. I would swap the chairs over with the seasons.. I want pink ones and blue ones.. oh and maybe a green one!! HELP... i'm so seeing myself buying some more... HELP ME!!!!! I love the nicknames for your children! This highchair looks great, no nooks and cranny for food to get into which is a big plus for me! Although I have 2 highchairs and can't really justify another! Mr still needs convincing.... grrr men! I think I'll get us one as a house moving present!!! !